Drive-thru garage plans are detached garage plans designed for the storage of one or more cars. Unlike most traditional garages, these special floor plans features at least one garage door at the front of the structure and one garage door at the back allowing cars and other vehicles to diver completely thru the garage. There are many conveniences with these types of garages. For example, it may be easier to pull straight thru the garage when pulling a boat or trailer rather than trying to back it in or out of the garage. In other cases, many find it is convenient to access the kids’ bikes and toys or even the riding mower without having to move the cars or risk dents and scratches in their doors. With a drive-thru garage, the possibilities are endless when considering the convenience of storing and accessing automobiles, ATVS, a golf cart, lawn and garden tools or other equipment. Some drive-thru garage plans incorporate thoughtful extras like a loft, workshop, storage area, extra tall ceilings, or full or half bath. These designs are available in a fabulous array of sizes and styles including single-story and two-story floor plans. There are many different styles to choose from as well, from traditional to country offering plenty of looks to complement your home. Various rooflines and garage door combinations further enhance the selection and offer flexibility. 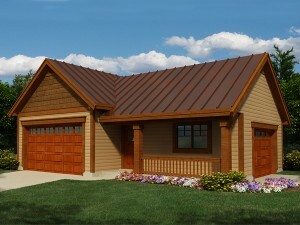 Take some time to browse the drive-thru garage plans and other designs at The Garage Plan Shop.